We’re thrilled that so many of you said that you’ll be joining us in this post and on Facebook and Instagram. Let’s get started! Each week through the end of April, we’ll be sharing pics of people’s progress on our Facebook and Instagram. And we invite you to share your pics too! 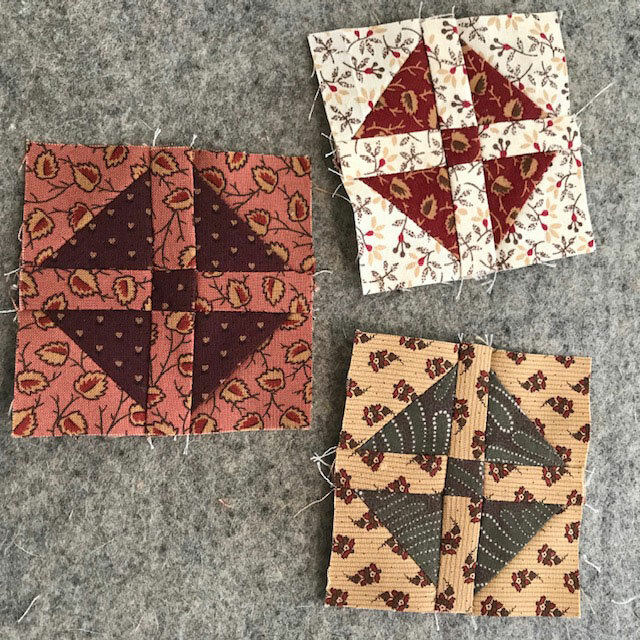 Use the hashtag #QuirkyLittleQuiltsQAL when posting photos of your progress so everyone can see, swoon, and share. 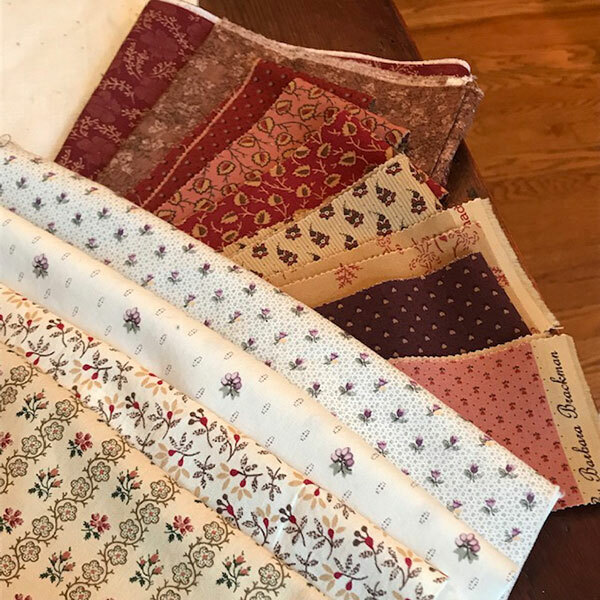 Including the hashtag will also automatically enter you into a random drawing for sweet fabric goodies from industry partners AND five books of your choice from Martingale! We’ll be sharing participants’ progress daily on Facebook and Instagram. 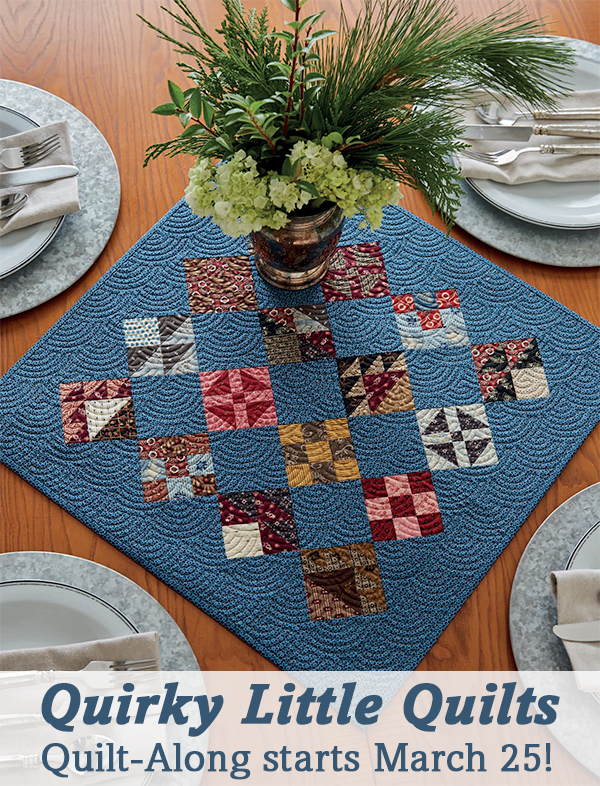 And each Friday we’ll be sharing peeks at the quilt-along right here at Stitch This! 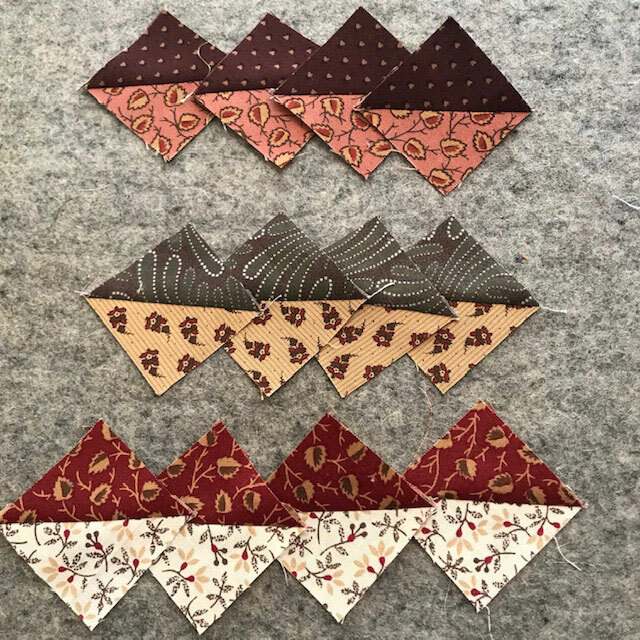 But since this is kickoff day, let’s see how Martingale’s content director Karen Soltys is coming along with her Shoofly blocks! 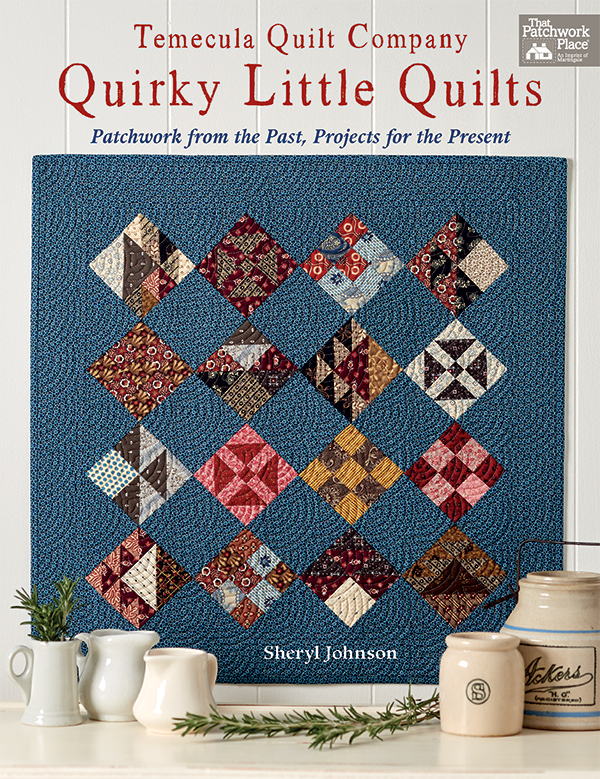 Do you have your copy of Quirky Little Quilts? Have you chosen your fabrics? Have you started sewing? Let us know in the comments; then grab your copy of the book, choose your fabrics, and get your sewing machine ready to quilt along with us! Love your fabrics! Great tip! I just finished my shoofly blocks! They are so tiny and so cute! This will be a fun mini quilt! forward to making this quilt with others who share my passion. I need this book. I am excited to start this project! I have the book and now am picking out fabrics so I can get started making the Shoo-fly blocks! I love your little quilts! 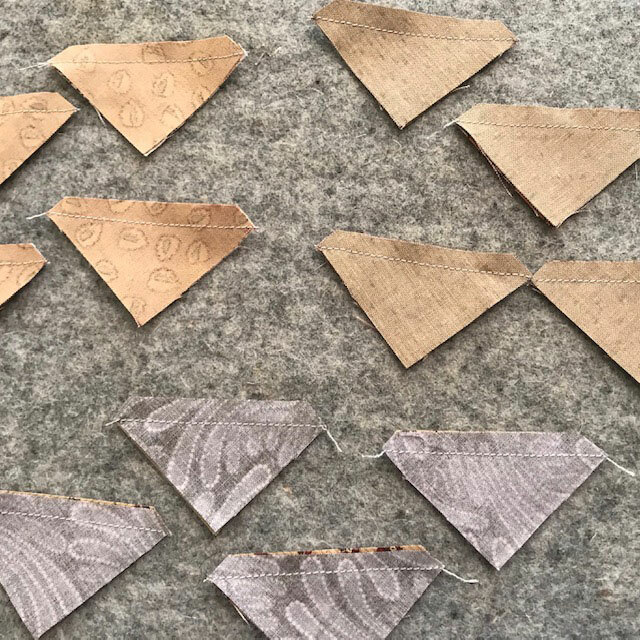 I hope there will be some tips regarding accurate piecing. Sometimes I do everything right I think), and my block comes out wonky or a bit too small or too big. I recently did a BOM from Paula Barnes and her instructions sometimes had directions to oversize things, then trim to the correct size. Pressing tips are great too! I made my blocks today and they went together quickly. I love batiks and chose some of those from my stash. Thinking I may go with solid black instead of blue background. I am not on social media, but I will be able to read the comments. I LOVE this little quilt! And the fabrics. Would love to win some, but if I don’t, I have lots of repros in a drawer! Thanks for the link to Instagram, Jenny! I will be able to view others now. Have the book and will get started in a couple of days. 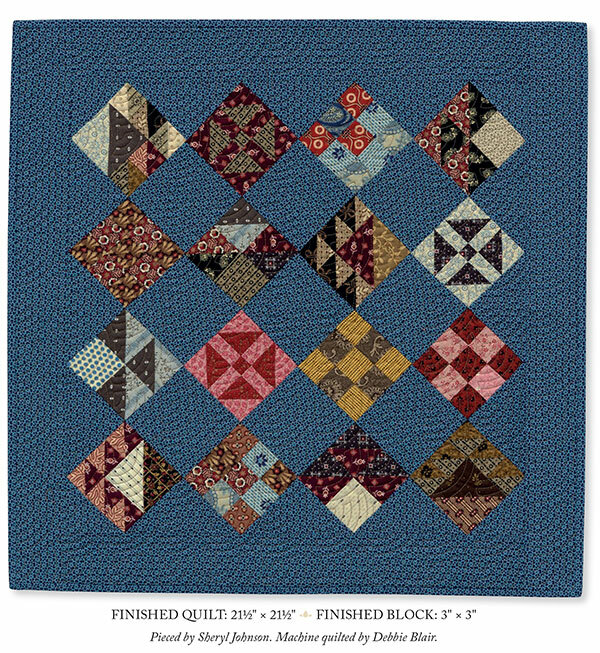 Love those quilts in the book! Loved visiting Sheryl’s shop not long ago! Just finished my Shoo Fly blocks and posted them on the Facebook site. What cute little blocks these are, I’m having so much fun!! Was going to start tomorrow —then a very good friend died an hour ago; will be starting tonight. Sewing, quilting will help me deal with my loss. I made a small trip around the world (close) about 20 years ago but a true bargello has long been on my bucket list. I would love some tips on how to choose fabrics. LOVE this book and quilt-along! I’m also cutting out blocks for a friends as I go. How many blocks should we make a week? Sweet little quilts, and I ❤️ Temecula Quilt Company! Oh how can I resist these cute little blocks!?! I was going to start this because I didn’t want to buy another book (I just spent $45 on books lol). But I have some civil war scraps that are just calling me! Guess I better get started so I’m not left behind. Just finished week one making 3 Churn dash blocks. I have been waiting for my book to arrive! I will do some catch up this week! Love the tiny quilt!